ZBag is available in 10 cool colors: Black, Gray, Navy, Red, Royal, Maroon, Forest Green, Purple, Neon Yellow, and Watermelon with our removable embroider-ready panels. 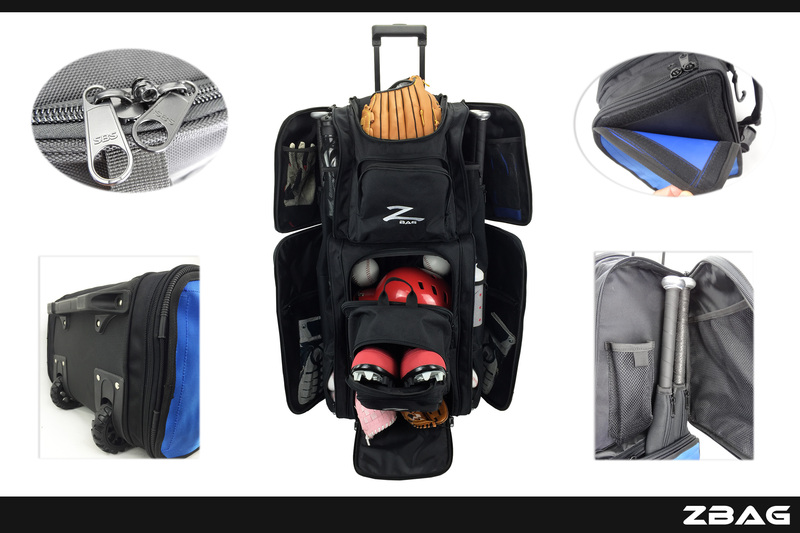 ZBags come in the color you choose at checkout. You can also order additional or replacement color kits and panels. Shipping is by FedEx Ground for the bags and or USPS for the panels and panel kits. Enter the number of bags you want to order, then select your bag color from the dropdown menu. Enter the number of Kits (4 panel sets) you want to purchase, then select your color from the dropdown menu. Enter the number of Individual Panels you want to purchase, select which Individual Panel you want, then select your color from the dropdown menu. 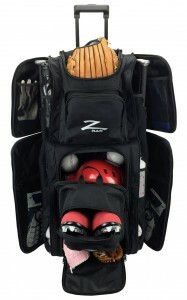 ZBag is a 3-bag modular system comprised of a 24” rolling bat bag, a 12” removable backpack for extra storage, and a removable multipurpose bag which can be used as a cooler, shoe bag, first aid kit or toiletry bag. The ZBag system was carefully crafted to comply with airline baggage regulations. This means you can take your gear and your travel needs in one bag. 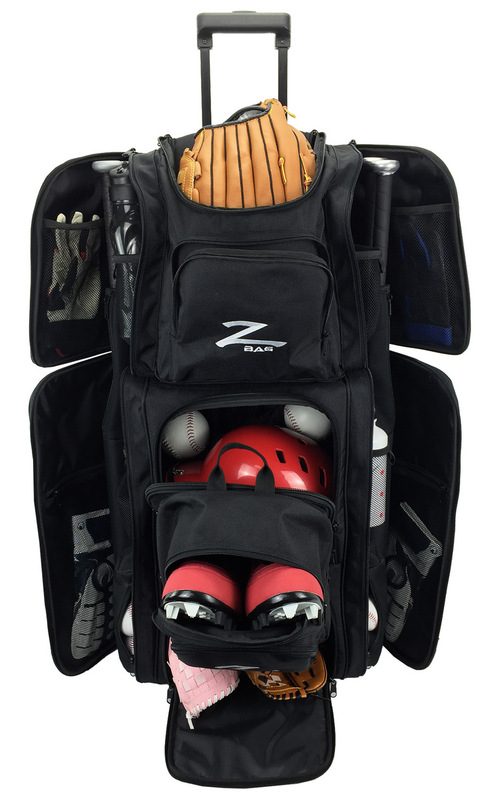 ZBag has multiple internal pockets for cleats, mitts, batting gloves, bats, water bottles and clothing. The backpack also has a padded laptop pocket. Single sling-style backpack strap stows away when not in use. Utility organizer pocket for pens, phone, iPod with headphone access. Could this fit more than 4 bats? It’s designed with 4 padded bat sleeves, but you could probably fit another regular sized bat on each side without a sleeve. Double-walled bats would probably not fit. 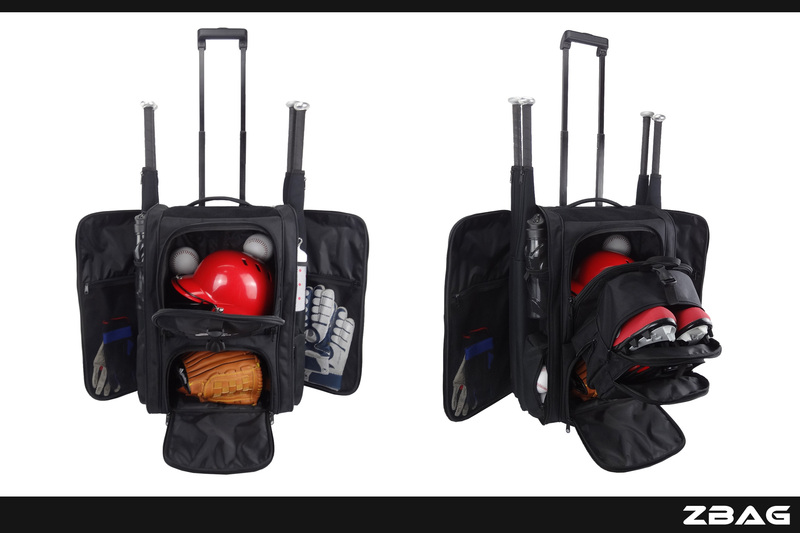 Is there a video or any reviews on this bag? I am looking for an ultimate bag for dragon boating, This one is close. With the exception that the paddle height is longer . The one flaw I am seing is that the interior should be another colour other then black. This enables you to find your gear easily. Does this bag come with coloured interior pockets? I see in one of the pictures with gray exterior pockets that the inside is gray.is the whole bag gray inside? Yes, so far the bags only have the dark interior. I’ll bring your suggestion for a lighter interior up with the designer for future consideration.